Mustard is a paste made from the seeds of one of several different varieties of mustard plants. The mustard seeds are usually ground and then mixed with water or vinegar. The paste can then be used as a condiment, as an ingredient in other dishes, or as an ingredient when making other sauces and salad dressings. 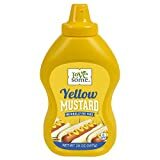 American mustard (also known as "Yellow mustard") - A very mild mustard with a bright yellow color created by mixing in tumeric. It is often eaten with hamburgers, hot dogs and sandwiches, used an ingredient in salad dressings, and is even sometimes rubbed into meat before barbecue grilling. Chinese mustard - A very hot mix of mustard powder and water. This variety of mustard is most commonly encountered in Chinese cuisine, but similar condiments can be found in Japanese cuisine (where it is known as "karashi") and Korean cuisine. 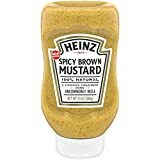 Dijon mustard - This is a mustard created using a method that was originally developed in the city of Dijon in France (although not all mustards of this type are nowadays made in Dijon). Dijon mustards generally both white wine and burgundy wine. English mustard - Very hot mustard with a bright yellow color. French mustard - Mild vinegary mustard with a brownish-yellow color. Wholegrain mustard - A mustard condiment made without fully grinding the seeds. Often more than one type of seed may be blended into the mix, and other ingredients such as sundried tomato or chilli are added in some varieties. A common condiment done uncommonly well. This bold and flavorful mustard is made with 100% natural ingredients, including stone-ground mustard seeds and a secret blend of spices and vinegar. Try it today on deli sandwiches, hot dogs and sausages Our Easy Squeeze bottle has a handy flip open cap, making serving quick and easy. For 100 years Nathans Famous Coney Island has been the benchmark in American Hot Dogs right along side of their equally Famous Deli Style Mustard. In fact, it's hard to tell what makes the meal; The Coney Island Dog or the Original Coney Island Deli Mustard. Let us Know! Maille Honey Dijon mustard is a go-to mustard for vinaigrettes or to glaze vegetable roasts, or in chicken recipes. Maille Dijon Originale mustard No added sulfites enhances the flavor of any meal. By adding just one teaspoon of Maille Dijon Originale mustard No added sulfites, you will unlock the full potential of any dish, even the most simple one. Maille Dijon Originale mustard No added sulfites is characterized by its creamy texture and smooth finish. 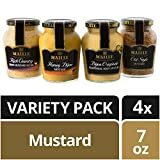 Maille Dijon Originale mustard No added sulfites pairs brilliantly with all types of foods, enhancing meat, fish, and vegetables dishes, in addition to sandwiches. Whisk it into vinaigrettes or use it as secret cooking ingredients in hot and cold sauces. Cooking it with macaroni and cheese or a hot potato salad will offer an unexpected, yet tasty, kick. At Maille, we believe firmly that the right ingredients can truly define a meal. With Maille's exceptional taste, just a spoon can turn any food into a culinary experience! The versatility of Maille is the best kept secret to enhance any dish, bringing excitement to your veggies, whole grains and lean protein like fish and chicken recipes. For over 270 years, we have been cherishing the resources - the land, the people, and their knowledge - that make our delicious mustard varieties possible. Established by Antoine-Claude Maille in 1747, the house of Maille was the official supplier to the Kings of France and many European Royal Courts. Don’t Make It. Master It. Fresh turmeric gives it the vibrant golden yellow. 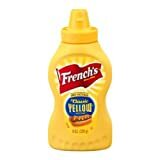 A bright yellow, American mustard, it’s made from the select yellow mustard seed, blended with vinegar and spices.